Country: display content to your viewer based on their country. The country is determined by the IP address of the visitor. Device type: specify which device this smart content is centered around (mobile, tablet, or desktop). HubSpot looks at what is called the user agent of your visitor’s browser to determine their device type. Since this can sometimes be changed on the device, we cannot always guarantee accurate segmentation. Referral source: show visitors your smart content based on how they found your site. Preferred language: personalize your content based on the language set within the user's web browser. Contact list membership: show a contact in your HubSpot database certain content dependent on whether or not they're a member of one of your HubSpot lists. Lifecycle stage: this will look at the lifecycle stage property of a contact in your HubSpot database and display the relevant content based on the value of this field. Hover over an existing page and click Edit. In the left panel, enter a Form title. Click the Form dropdown menu and select a form. Click the make smart icon. In the dialog box, select the criteria you want to base your smart content rules on. In the left sidebar editor, under the Options tab, create your smart rules. 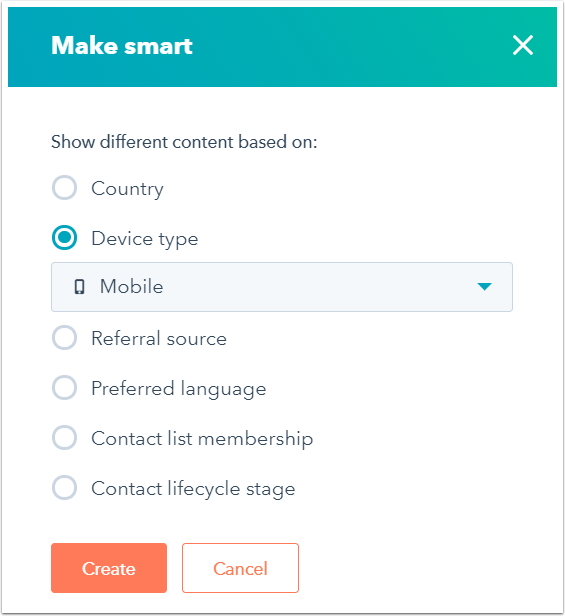 Click the Content dropdown menu to jump between your default content and the content your smart rules will be based on. To add smart content rules, click Add rule. To change the order of your smart rules, click Reorder rules, or click Delete all rules to remove your smart rules and convert the rich text module back to a traditional (non-smart) module. Click Save and go to module list. Click the Preview as a specific contact dropdown menu and select a contact name to preview the content this particular contact would see on your page. Select the Preview page from a specific country, Preview page in a specific language, or Preview page from a specific traffic source checkbox to test the smart rule behavior for these anonymous rules. In the upper right, click Publish to take your changes live. In your design manager, click the name of the template with the form module you want to make smart. 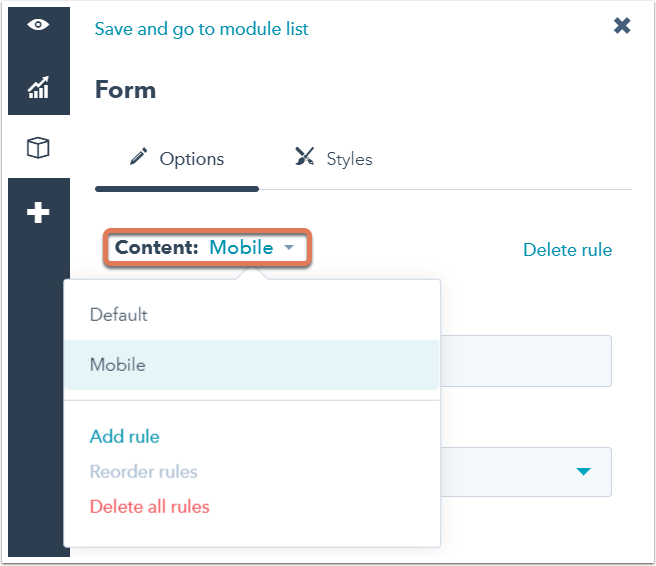 In the right module inspector, Default content section, click the Form dropdown menu and select a default form for the module. Click the More dropdown menu and select Make module smart. In the right panel, Default Content section, create your smart rules. 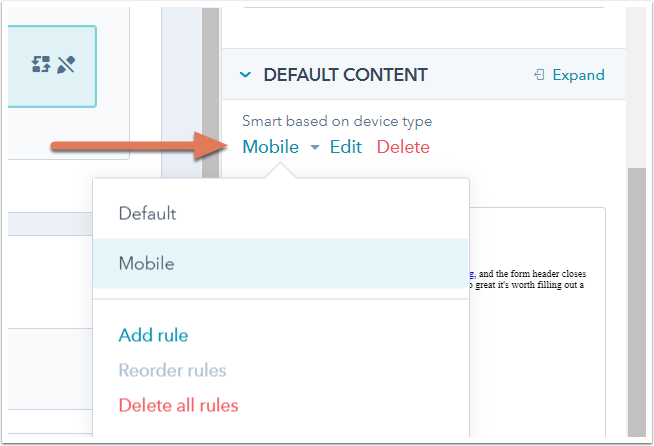 Use the Content dropdown menu to jump between your default content and the content your smart rules will be based on. To add smart content rules, click Add rule . To change the order of your smart rules, click Reorder rules. To remove your smart rules and convert the rich text module back to a traditional (non-smart) module, click Delete all rules.